Unicoi State Park is one of the most popular parks in Georgia. Some of the many reasons why it attracts so many visitors includes the parks outstanding natural beauty, a wide range of amenities, and Unicoi State Park's proximity to the alpine village of Helen. Smith Lake, often called Unicoi Lake, is the scenic centerpiece of the park. There are opportunities to fish, swim and enjoy a picnic here. Smith Creek is situated above and below the lake and trout fishermen are often found in its waters. Both the lake and creek are subject to the state of Georgia fishing regulations. You must follow the state's licensing and catch requirments. The park's location in the mountains of north Georgia means there are plenty of other areas around the park where you can enjoy the outdoors. 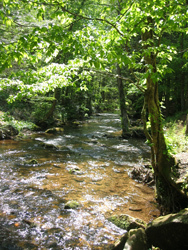 The park borders the Chattahoochee National Forest. Anna Ruby Falls Scenic Area (access fee required), where on can access the trailhead to Anna Ruby Falls, is found just outside the park. There is no gated entrance to the park. The main road through the most visited portion of the park is a loop formed by two roads, state highway GA-356 and "Unicoi Campground Road." GA-356 passes over the impoundment that forms Smith (Unicoi) Lake. There is a parking area at either end of the impoundment. From Unicoi Campground Road you can access the camping office, the campgrounds, the road to Anna Ruby Falls, and most of the parking areas, picnic facilities, and restrooms. Visitors to Unicoi State Park are required to pay a $5per-vehicle day use fee. You can also purchase an annual pass for $50. Each of the many parking areas in the park has a self-service fee box where you can pay the $5 fee and obtain a pass to hang from the mirror of your vehicle. You do not need to pay the Unicoi park fee if you are only passing through Unicoi to get to Anna Ruby Falls - which is a federal facility that charges its own entrance fee. The fee and pass for Anna Ruby Falls is not valid for Unicoi State Park. If you visit both Anna Ruby and Unicoi, you need to pay two different fees. Helen - A Bavarian style alpine village with a downtown that features interesting architecture and a shopping district with many interesting stores. Innsbruck Resort and Golf Club - A championship course designed by Bill Watts, overnight accommodations, a pool, tennis courts, and a clubhouse with a pro shop. There is a wide range of things to do at Unicoi. This includes many of the typical things you might expect from a larger state park situated in the mountains: hiking, mountain biking, swimming, fishing, boating (non-motorized), picnicing, and more. There is also an opportunity to participate (for a fee) in what the is advertised as adventure activities. This website is not affiliated with the state park or the state of Georgia.